Mish are a band that set expectations and immediately set about destroying them with a crushing and beautiful focus that will spellbind the listener. Today they announce the release of their brand new album Entheogen - a devastatingly heavy and complex (Mish) mash of various influences and styles. Bird's Robe will be releasing the record and it's available for pre-order now. Originating as a collaboration between Mark (drums) and Rowland (guitar and vocals) in the rural landscape of Bathurst for two years before migrating to Sydney for richer artistic landscapes, the duo joined forces with Gazi (bass) and Hen (keyboards and samples). After six years, the wait is over. 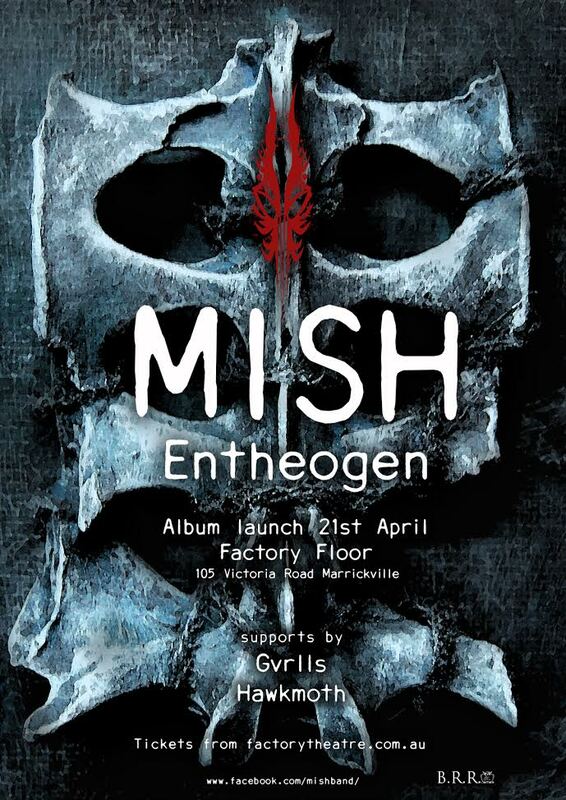 Entheogen, the second album from the progressive metal giants, will be released on Friday 21st April, supported by a launch at Sydney’s Factory Floor that night, with support from Gvrlls and Hawkmoth. Mish have poured the hard experiences of the last half decade into one of the most cathartic and passionate records in the Australian underground. From one epic to the next, Red Fortune to Artax this is a record that leaps off of the precipice of the high water mark set by their debut. Mish are a mysterious yet beautiful beast, with music as heavy as it is emotional. Their rare yet often-talked-about live shows have seen them earn high profile supports, whilsts also painstakingly producing just two full-length albums in their 11 years of existence. The six-year development of Entheogen follows the five-year gestation of their debut album The Entrance which was released in 2011 to universal critical acclaim through the progressive and metal underground and propelled the band to cult status amongst lovers of raw and energetic progressive metal. The band played in support of international icons such as Russian Circles, Pelican and sleepmakeswaves, earned radio play on triple j and hit the Top 10 on triple j’s Unearthed metal charts for a mammoth 16 weeks with their emotionally-charged track A Fire Inside. The 11-year partnership between frontman/guitarist Rowland Hines and drummer Mark Johnstone has fuelled one of Australia’s most memorable live bands. Although rare, their recorded output finally brings one of Sydney’s most loved heavy acts to an international audience. Produced and recorded again with Clayton Segelov of The Brain Studios, the new album’s visceral production process follows the same path tread by their debut. The production of The Entrance memorably saw Segelov ordering Rowls to run laps of the inner city studio block until visibly exhausted (chased and pushed by the studio assistant), then running back into the vocal booth to hurl the dogged and desperate howls which rip open the record. Informed by six years of turmoil, relationships and life experiences, Entheogen once again finds a band on the cusp of catharsis, hungry for action yet reflective. The album’s crushing riffs and metal-influenced breakdowns are reminiscent of acts such as Isis, Rosetta and Meshuggah - yet their unique melodicism sets them apart. Technically proficient, yet with masterfully crafted songwriting, make this act a unique and compelling listen for heavy music fans.